Starting September 13, the State Employees Combined Appeal (SECA) campaign is back at Illinois State University. SECA allows all state employees to donate to local, state, national, and international charities that have been vetted through the state. SECA Illinois supports nearly 2,000 charities. One hundred percent of contributions are sent directly to the designated charities. Charities may be found using the Charity Search Engine and donations may be made online at the SECA Illinois website. Participants must register on the site to make a donation. Employees can also donate through payroll deduction, or write checks directly to the charities and send them through campus mail to Campus Box 3090. 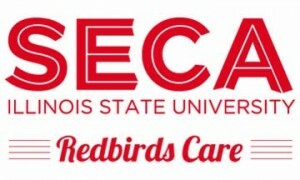 A link to the complete list of SECA charities as well as the donation forms can be found on the Redbirds Care SECA website. The campaign runs through November 8.